SCVHistory.com | St. Francis Dam | Los Angeles Evening Express, 3-14-1928. Los Angeles, California | Wednesday, March 14, 1928. DEATH LIST LEAPS IN DAM DISASTER. WALL LEAKED BEFORE COLLAPSE IS CLAIM AS PROBE LAUNCHED. The St. Francis Dam collapsed at 11:57 am on March 12, 1928. As such, due to reporting deadlines, the first reports of the disaster did not appear in most morning newspaper editions in Los Angeles and elsewhere in the country until March 14. However newspapers with evening editions such as the Los Angeles Evening Express were able to report on the dam break as early as the next day March 13. 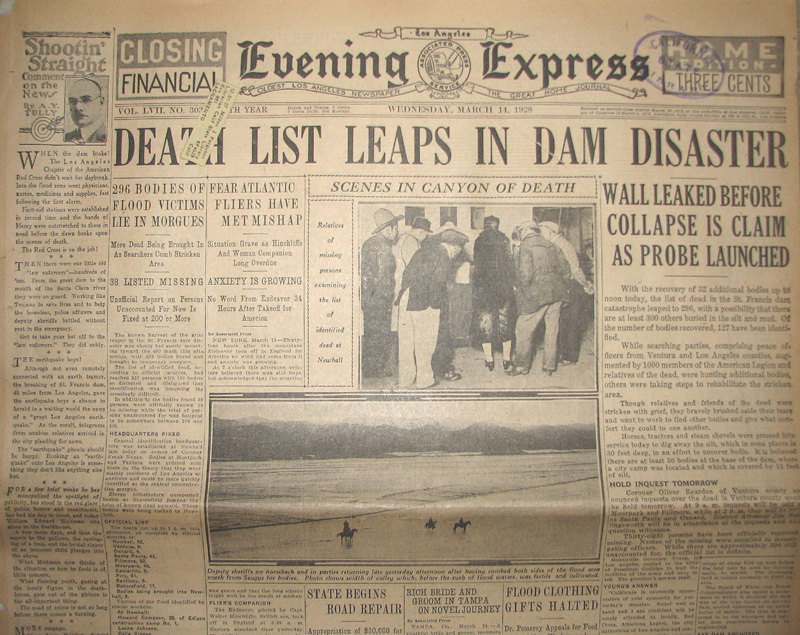 Therefore, this March 14, 1928 edition of the Evening Express represents the second day of reporting on the dam disaster.